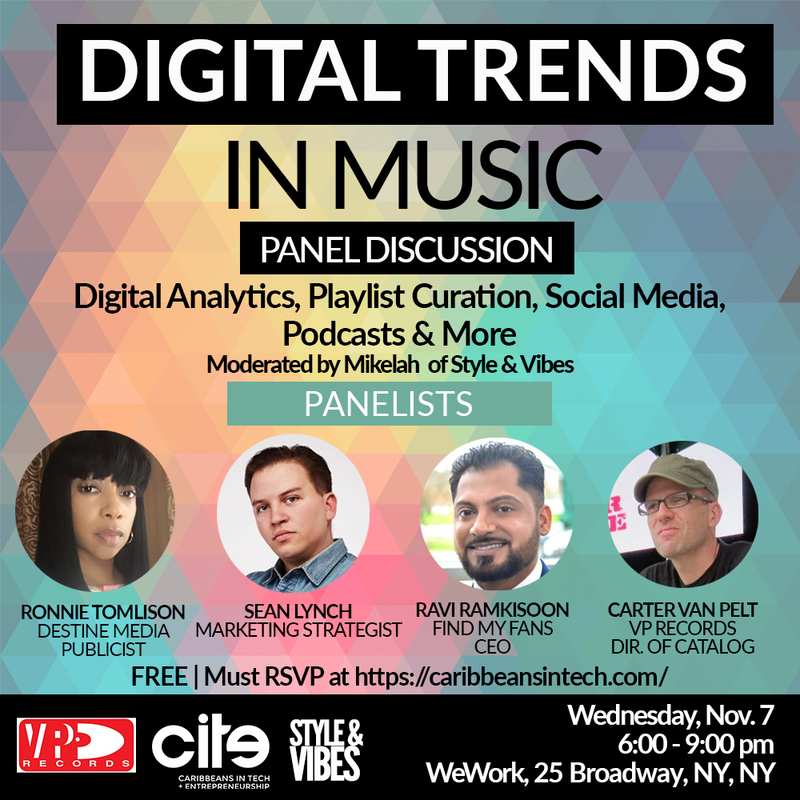 VP Records in association with CITE Collective and Style & Vibes, is proud to present an in-depth panel discussion titled “Digital Trends in Music” next Wednesday November 7th at the WeWork at 24 Broadway in Manhattan from 6:00pm-9:00pm. The event will be an informative and detailed conversation on digital analytics, playlist curation, social media, podcasts and more. Moderated by Mikelah of Style & Vies, the FREE event is ideal for anyone interested in learning more about the digital segment of the music industry and beyond. When it comes to music, digital has changed the way artists reach their fans and how fans consume artists’ music. With so many avenues to discover new music putting some context behind how the digital landscape has impacted Caribbean artists. The panel is dedicated to discussing digital trends as it relates to music, there will be discussions on how analytics, playlist curation, social media and podcasts are changing the way artists reach their fans and make money with the tools within their reach. The panelists, Ronnie Tomlison (Music Publicist & CEO of Destine Media PR), Sean Lynch (Marketing Specialist), Ravi Ramkeesoon (CEO of Findmyfans.co) and Carter Van Pelt (Director of Catalog for VP Records) represent the best in marketing, publicity and more. Ronnie Tomlison is a Publicist at Destine Media which is an elite Public Relations company efficient in marketing, promoting and advertising talent (Buju Banton, Tarrus Riley, Mavado, Jahmiel and more) through effective media outlets. Sean Lynch, the Vice President of Marketing at JSSI, overseas all marketing aspects for their brands – Lugz, Guy Harvey, Emeril Lagasse, and British Knights. He formally served as FILA North America’s Marketing Manager, where he oversaw social media, influencer marketing, athlete programs and more. After receiving a B.A in Communications from St. Francis College, he was a journalist at Complex, MTV and The Source Magazine, where he served as The Editor. Ravi Ramkisoon is the CEO of Find my Fans, a geolocation app which launches this December. The innovative app will allow artists with accounts to see where their music is being streamed and where their followers are located. The Trinidad born entrepreneur is a graduate of Harvard Business School and an avid listener and follower of soca and Caribbean music. Rounding out the panelists, Carter Van Pelt currently serves as VP Records’ Director of Catalog Development and is responsible for promoting projects from its catalog of 25,000 masters. In addition to this massive task, he is also the founder and operator of the popular Coney Island Reggae On The Boardwalk summer reggae sound system series. Carter is also a DJ and has curated over 50 playlists for Apple Music, including Fela Anikulapo-Kuti, Bob Marley, Gregory Isaacs, and Dennis Brown (Essentials, Next Steps, Deep Cuts), and the 100 song Classic Reggae Deep Cuts. VP Records, founded by Vincent Randy Chin and wife Patricia Chin in 1979, is the world’s largest record label for reggae music. Together, the Chins have acquired a roster of reggae legends including Shaggy, Sean Paul Beenie Man, Bounty Killer, Mavado and more. Their adoration and ardor for reggae music, the history, the present and the future has been instrumental to the label and its artist’s monumental achievements. VP Records is also the parent label to Greensleeves Records, Riddim Driven Clothing, 17 North Parade, Reggae King Radio and Dub Rockers. Through all their numerous ventures, VP Records continues to be miles ahead in reggae and soca music. A collective nurturing Caribbeans in Technology and Entrepreneurship. Based in New York City the collective organizes online and in-person events to cultivate conversation and collaboration in the technology and entrepreneurship space. A digital media platform dedicated to Caribbean-American life, style, music, culture and more founded by Mikelah Rose. Mikelah is a Caribbean Culture expert, curating the bridge between the Caribbean and its diaspora. A CUNY Baruch College graduate with a BBA in Marketing. With previous experience with Caribbean lifestyle brands such as VP Records, Tempo TV and JAMROCK Magazine. Currently serving as a digital marketing manager by day, while continuing to collaborate with Caribbean brands.